ALL Premier League clubs have agreed to improve access for disabled supporters by August 2017. Fifteen out of 20 clubs will have to increase capacity to comply with guidelines on accessible stadiums. A Premier League statement said: “We are undertaking our own assessment by surveying every Premier League stadium to determine improvements for disabled access. “Disability access was discussed at the Premier League shareholders meeting last week with several new proposals agreed. “It has been a very long time coming (more than 14 years) but we wholeheartedly welcome this announcement. “The promises will ensure that many more disabled fans can finally enjoy a fair and equal experience alongside fellow fans, friends and family. “For disabled football fans this is huge news but as always, the proof will be in the pudding. Level Playing Field looks forward to working with the PL and its clubs to deliver on their promises. On Monday, a Government report criticised the inadequate facilities and support for disabled fans at Premier League grounds. 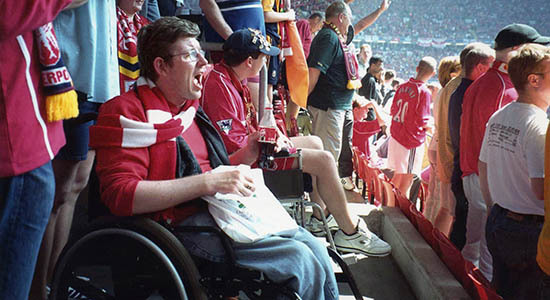 The ‘Inclusive and Accessible Stadia Report’ highlights the frustrations of disabled sports fans across the UK and found that some disabled fans are unable to sit with their children, or with their fellow supporters, when attending matches. Not being able to move around the stadium easily. Disabled parking spaces being taken up by limos or TV crews. A lack of disability awareness among stewards and staff, particularly when dealing with hidden disabilities. “As a life-long sports fan, I take it for granted that I can support my team each weekend. Everyone should have that same opportunity, and it’s absolutely unacceptable that this is clearly not the case. “Sport has a proud history of rising to social challenges and I urge clubs to stand by their disabled fans, just as their fans stand by them.